Canadian metal vets Kittie's stage set-up is about to look a little different, as bassist Ivy Vujic has announced her impending departure from the quartet. The roster shake-up shouldn't affect the band too much, though, as they've already found a replacement: former four-stringer Trish Doan. Vujic's split from the fold seems amicable enough, with the bassist admitting she just needs to move on with her life. She had joined the band in 2007 as Doan's replacement and performed on the group's last two records, In the Black and last year's I've Failed You. Vujic will be playing the shows Kittie have lined up in London, ON and Toronto this week, as well as a few shows across Australia at the end of the month before Doan rejoins the fold for a massive North American tour. "After four amazing years of jamming with my crazy metal sisters, I am officially resigning," Vujic said in a statement. "After a lot of touring and two albums, I feel it is time for me to move on. There are still other things for me to do in my life. Although I will always appreciate Kittie and the amazing fans we have, it does not fit my plans right now." 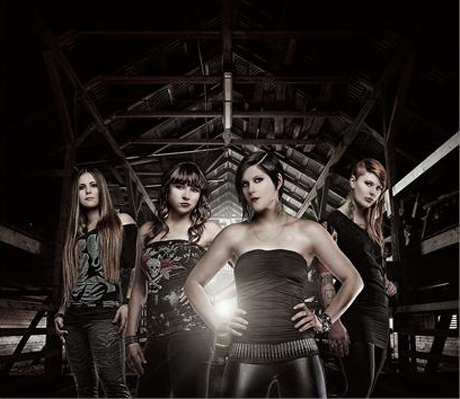 Kittie frontwoman Morgan Lander said she's sad to see her now-former bandmate go, but is thrilled to bring back Doan, who had played with the troupe from 2005 to 2007. "We are ecstatic that she will be returning to bass duties and are looking forward to the tour this spring! We love both girls and are glad that we all remain friends, first and foremost," she wrote.